There are several large-scale digitisation progammes going on world wide which are starting to make substantial numbers of historic newspapers available online, a God-send for anyone engaged in research into early film. Some are freely available, some restricted to universities, some are commercial operations. There are various ways of getting at all of them, and in any case one shouldn’t shy away from paying a little for access to such treasures, given the huge efforts made to digitise them (something I know a little about). 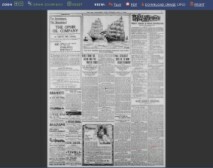 This survey covers some of the major historic newspaper resources available. For each, I’ve tested them out with the word ‘Kinetoscope’ (i.e. Thomas Edison’s peepshow viewer which first exhiited motion picture films to the public, and which was most commercially active in the 1894-1896 period, but carried on as a common term for a few years after that). The Library of Congress is co-ordinating a huge newspaper digitisation programme, entitled Chronicling America. The project is sponsored jointly by the National Endowment for the Humanities and the Library of Congress as part of the National Digital Newspaper Program. So far it has digitised selected newspapers for the period 1900-1910, covering California, District of Columbia, Florida, Kentucky, New York, Utah, and Virginia. That’s thirty-six newspapers, including such key titles as The San Francisco Call, The New York Sun, The Washington Times, The Colored American, and The New York Evening Times. Searching across all papers and all dates for the word ‘kinetoscope’ got me 71 hits. Clicking on a result gives me a picture of the full page, then options to view the OCR text (i.e. text derived throgh scanning using Optical Character Recognition, which may bring up some small errors), PDF, or I can download the image as a jp2 file. The term I searched for is highlighted on the image, and I can zoom in or out. Each hits gives you the title of the newspaper, the date of the issue, and the page number. On a quick survey of the texts, I saw the Kinetoscope was being commonly used as a generic term for motion pictures, rather than the Edison machine specifically. Chronicling America is free to all, easy to use, and is certain to grow as the phased digitisation programme develops. The site has background information, including technical details for those entranced by TIFFs and JPEGs. Probably the most outstanding of the newspaper digitisation programmes, and the one that has had a great impact on research across any number of disciplines, is the Times Digital Archive. This is a commercial operation, managed by Thomson Gale. It offers every page from the London Times 1785-1985. It is possible to search for a term or phrase across all dates, a specific date or a date range, and across all types of section, or restricted to Advertising, Business, Editorial and Commentary, Featurees, News, People and Picture Gallery – this is a very useful feature for narrowing down searches. Searching on ‘kinetoscope’ across all fields got me 60 hits. 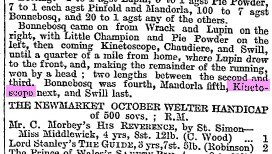 As it covers the 1890s period, the rsults were excellent, tracing the Kinetoscope’s appearance in London, from a first mention on 8 March 1894 of Edison’s latest invention, to the surprise discovery that in 1897 there as a racehorse called Kinetoscope (not a very successful racehorse, it seems). Search results cite the date, page, issue number and page column of the relevant article, with the search term highlighted on the page. You can view the relevant article or page as PNG images, or view the page as PDF. Such a wonderful resource comes at a price. It isn’t freely available, and instead it is made available to institutions in a variety of subscription packages. In the UK, most universities subscribe to it, under the Athens password system (which restricts online resources to UK academic users), but it can also be found in many public libraries. It is also available through subscribing international institutions as well. And then there’s the Google News Archive search. Naturally enough Google has provided us with a search engine which browses historic news resources, both free and subscription-based, so you are offered tantalising glimpses of news stories that can be yours if only you’ll pay. 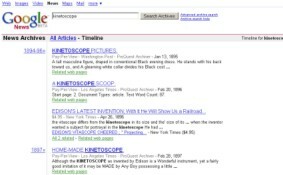 Typing in ‘kinetoscope’ yields 2,210 results. The results seem all over the place, but it is possible to narrow down the search by date or newspaper, as Google assesses which areas are likely to yield the most results from your broad search query. It can also arrange results in a handy ‘timeline’ fashion. It’s worth noting that many of the subscription sites, such New York Times, give you at least the first few lines of the requested article. Speaking of the NYT, you can pay $4.95 to view a single page, $7.95 a month (up to 100 articles) or $49.95 per year (up to 1,200 articles). Find out more from its TimesSelect service. The British Library maintains the national collection of newspapers (still housed in quaint conditions at Colindale in North London). It has had had for some while a test online historic newspaper service, using Olive Software, which offers some year-long slices from four sample papers: News of the World, Manchester Guardian, Daily News and The Weekly Dispatch, from which only the News of the World gives a Kinetoscope story – on the racehorse, in 1900. But now the British Library is engaged on a massive British newspaper digitisation programme, with higher education funding money (the JISC Digitisation Programme). The first stage of this, recently completed, has digitised 2 million pages of 19th century newspapers. Stage two, just begun, will add a further 1.1 million pages from 1690-1900. The results, however, will be accessible to UK higher and further education users only. The lessons to be learned are simply that, if you want serious access to knowledge, you need to pay or to be a student. The number of precious resources being made available only to universities is a problem for the outside researcher, though that’s where the money is coming from, and in many cases it’s the only way of getting round licensing restrictions. There are commercial sites, such as ProQuest, which is a world leader in providing access to digitised resources to institutions, including historic newspapers. Like a number of these services, it offers free trials – but only to institutions. The massive NewspaperARCHIVE.com welcomes individuals. It boasts over 68 million pages, and lets you know your search results for free, so Kinetoscope yielded a tantalising 2,923 hits. Annual membership starts at $8.95 per month. But there are many smaller initiatives to look out for. A while back, I wrote a post on The Silent Worker, a newspaper for the deaf, which had many articles on the deaf and silent films. I found the information on that from the British Columbia Digital Library, which has a very useful listing of digitised newspaper collections around the world. And if you are frustrated at not being able to get hold of subscription-based collections, I recommend the Godfrey Memorial Library, an American library specialising in genealogy resources which for a very cheap annual subscription (from $35.00) offers access to a large number of newspaper libraries, including the Times Digital Archive. There’s so much out there. If you know of other collections, or directories of information, do let me know.